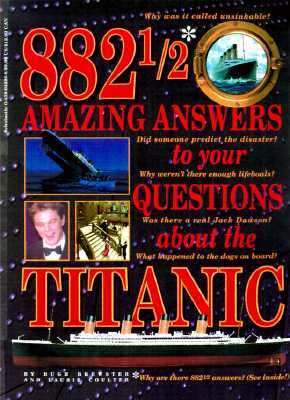 882 1/2 Amazing Answers to Your Questions About the Titanic by Hugh Brewster and Laurie Coulter. Grades 3 and up. Scholastic, 1998. Copy provided by my local library. 96 pages. Maybe I'm a little irreverent, but when I heard that the collaborative theme for this year's Summer Reading Club was "Make a Splash", one of my first thoughts was "Would it be wrong to do a program on the Titanic?" And that's what I'll be doing this Thursday*. So, I needed to do a little research and I've been digging through our books on the subject. 882 1/2 Answers is one of the most helpful and interesting books I've found, so I knew I wanted to review it for Nonfiction Monday. Why 882 1/2 answers? Because the Titanic was 882 1/2 feet long! The book's organized into simple questions and answers, starting with questions about the development and building of the ship, moving to questions about what was on board the ship and what the voyage would have been like, to questions about the sinking, and ending with questions about what happened afterward. The format is spectacular for gleaning trivia questions (which is one of the reasons I was reading it) and the book also has an index so you can find answers to particular questions. Photos and color illustrations are included and they help bring the text to life. If you don't have this one in your library (public, school, or home), you'll definitely want to pick it up. This is a book I can see kids poring over for hours and sharing with their friends. How much did the Titanic cost to build? How many bathtubs were in third class? Don't wait to go and pick up this gem! And also, don't forget that today's Nonfiction Monday and you should check out the roundup over at Charlotte's Library. Bon voyage! *You can expect a post about it afterward. I'll let ya know what we did and how it went. I'm dying to know... what was the half question?? Love, love, love the new look of your blog! Really fantastic!